At the VR Discovery Zone ! For the first time, TRUSTECH gives its visitors the opportunity to experience immersive technologies based on Augmented Reality / Virtual Reality. Come and test the lastest trends and innovations that will shape the future of finance and business. From Artificial Intelligence to Augmented Paper, 3D printing and data visualization, many demos will be available to discover tomorrow’s professional world. Ready to try immersive technologies for your company? Come and meet Easycom and Laval Virtual to imagine Augmented Reality or Virtual Reality solutions that meet your challenges and enable you to develop your business. Dive in the seabed, roller coaster, 360° virtual tours… TopVirtuel garantees you real sensations! Thanks to HTC Vive Helmet, you will live unique fun and unusual thrills at the forefront of technology. 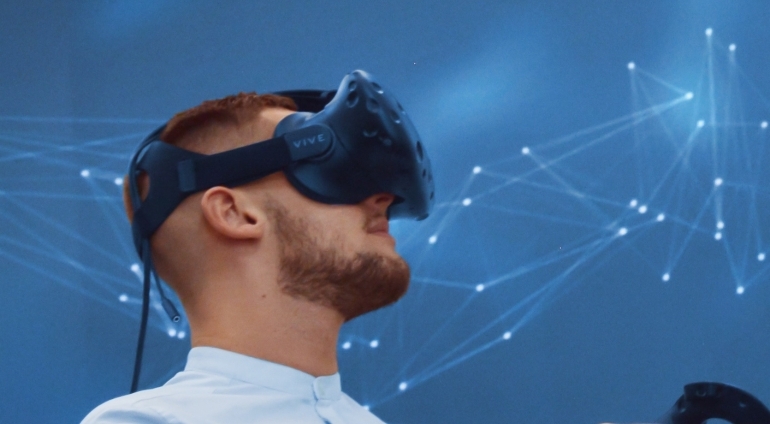 Created by VR-Connection, this virtual reality POC (proof of concept) aims to discover the benefits of technology in the field of Data Visualization. The 360° interactive environment makes it possible to understand and highlight data intuitively and in a playful way. With Big Data and digitization, many cases will open a new field of innovation for many professional sectors. VR Connection is the first hub dedicated to Virtual Reality. Created in 1998, APY is an integrator well-known for its responsiveness and expertise in the design and integration of tailored professional IT solutions for the image trade. - In partnership with PNY and Wosomtech, presentation of an image segmentation solution by a neural network to identify different types of objects and humans. eMotion Tech, specializes in the development and distribution of 3D printers. French pioneer in this sector, eMotion Tech has been developing printers in educational and playful kits for individuals and schools for five years now. They will present their latest machine, the I3 metal motion, a robust 3D printer, fast and accurate but also fun and easy to use proposed in a kit for the price of 650 €. Easycom is a Consulting and Creative agency specialized in sales development through immersive technologies. It will be presenting PaperOn, its Augmented Reality app. Catalogue, magazines, packaging, promotional leaflet, posters, product displays, letters, business cards... PaperOn is the application that gives life to all printed media. Forget about “Waow Effect”, think “clients benefits”. Technology is the way to convince the client, it is not an end it itself. Easycom is here to support companies in the design of their project (issues / uses / scenario), in its integration and communication (communication action plan, ROI measure). If blockchain* technology has multiple application sectors, finance is one of the sectors that will be revolutionized by this technology with annual savings ranging from 7.5 to 11.3 billion euros per year by 2025. Cryptobjectif has a role in Crop Monetary Investment Counsel. This company also offers its clients investment management contracts. Definition of blockchain: The blockchain is a technology of storage and transmission of information, transparent, secure, and functioning without central control body (definition by Blockchain France). EyeSnap is a french start-up marketing custom-made solutions based on visual recognition. EyeSnap's ambition is to "make the images speak" by analyzing their content thanks to an innovative technology combining dedicated algorithms and artificial intelligence. The app developed around the EyeSnap technology makes it possible, for example, to find counterfeits on the internet or to determine the brand and model of a vehicle from a mobile application such as Lookar from a simple photo.